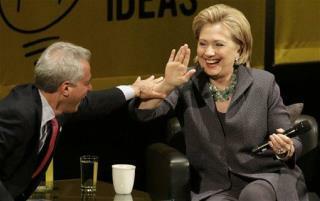 (Newser) – Information pieced together from recent WikiLeaks releases and the FBI investigation of Hillary Clinton reveals that Chicago mayor Rahm Emanuel has also used a private email configuration. The Chicago Tribune reports that the domain, rahmemail.com, was registered on May 16, 2011—the same day Emanuel was sworn in as mayor of Chicago. Emanuel's spokesman Adam Collins says the mayor only uses a custom email domain, not a private server. Collins explains "After the mayor's election in 2011, the campaign fund set up a new email to ensure the mayor was not using government email for private or political use, which could violate city ordinance or state law. A dedicated Gmail domain allowed for better security given the growing threat of cyberattacks." It's not clear whether Emanuel conducted government business on a personal email account. This is dumb. "Private Email Setup" -- you mean custom domain name. Anybody can check his email MX domain to see whether it's handled by Google's servers. It's not like he's a paragon of great leadership and outstanding personal responsibility.... maybe that's why I'm not surprised. I miss the days when corruption was as innocent as firing up the Uher and "accidentally" erasing part of a tape. Well, it's not like anybody considers him a pillar of society.